This is a guest post from Bill McWeeny, a science and math teacher at the Adams School in Castine, Maine. Every year, his students embark on a learning and education initiative based on the critically endangered North Atlantic right whale. 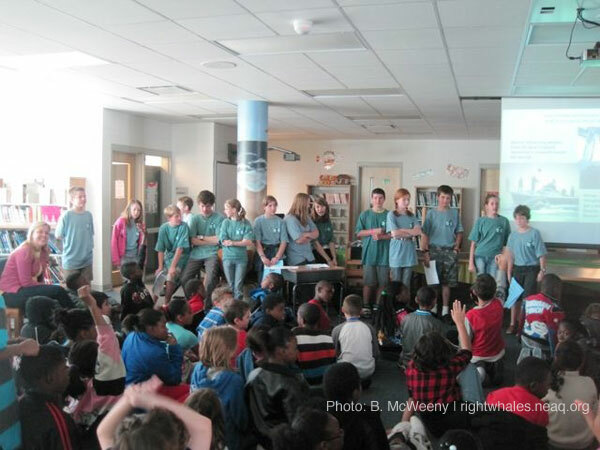 His students are up for an Ocean Heroes Award from the marine conservation group Oceana for their exceptional accomplishments in ocean conservation, advocacy and education. Here's a little bit about this very special group of kids. Visit www.oceana.org/heroes to vote for the Calvineers by July 11! On June 11, the Calvineers hosted a Whale Day on the Castine Town Common to give back to the community that has supported them in their quest to “educate the public about the plight of the North Atlantic right whale.” For the past eight years, 7th and 8th graders from Adams school in Castine, Maine, have been traveling far and wide spreading the word about these critically endangered marine mammals and how people can help. 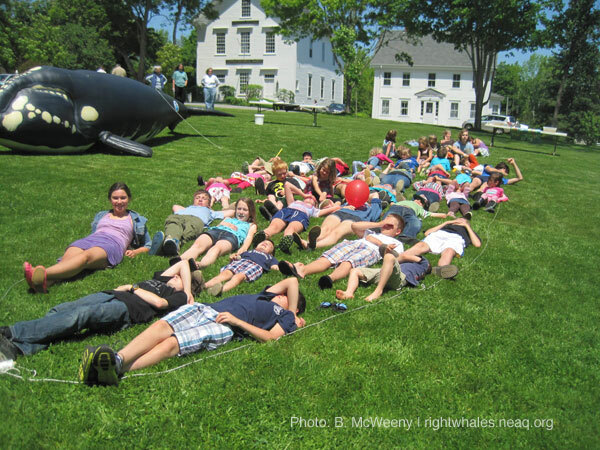 Castine's Whale Day: How many people can fit into a right whale’s outline? The Calvineers do their homework. They participate in a one-hour class every week called “Whaleology” in which they learn basic science about cetaceans including anatomy, physiology and ecology. Calvineers also volunteer one afternoon a week doing research on current work being done on right whales. They have Right Whale Consortium scientists as mentors to help them understand the science and the issues being worked on to help save the world’s most endangered large whale. Each year the Calvineers attend the Right Whale Consortium meeting in New Bedford, Massachusetts, and listen to scientists explain current research projects. In addition the Calvineers have travelled to Grand Manan Island to see live right whales, visited numerous museums that have right whale displays. The Calvineers have spent time with scientists in the field at the New England Aquarium’s Right Whale Field Research station in Lubec, Maine (more on that here and here! ), the NOAA Northeast region office in Glouster, Massachusetts, the MERI research center in Blue Hill, Maine, the Woods Hole necropsy laboratory in Woods Hole, Massachusetts, and the Provincetown Center for Coastal Studies on Cape Cod. Once a year each Calvineer produces a few PowerPoint slides about the topic they have been studying with the help of their mentor scientists. Topics include acoustics of whales and of the ocean, genetics, population management, entanglement and scarring, surveying, health and disease, shipstrikes, policy decisions and politics and even ethics and animal rights. Their individual slides are woven together into a 40-minute PowerPoint presentation that the Calvineers give to other schools and community groups. The presentation educates people about right whales and their current status and it also gives the public ways that they can help. Over the years the Calvineers (more on their namesake here) have presented from Quebec and Campobello Island in Maine to Tampa and Saint Petersburg in Florida. 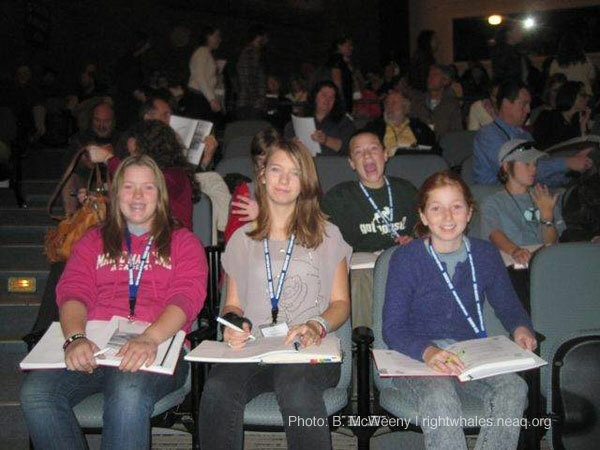 They have presented to school children, community groups, scientists and even “celebrities” like Senator Susan Collins and Jane Goodall. Thousands of people have learned about the plight of the North Atlantic right whale from the Calvineers. Many Calvineers have gone on to work in the sciences. There are three Calvineers working at marine science institutes this summer. Other Calvineers are enrolled in engineering programs, biomedical research and pre-med programs. Please vote for the Calvineers by July 11 at www.oceana.org/hereos! Please vote for the Calvineers BY JULY 11TH at www.oceana.org/hereos! Learn more about the incredible right whale, and the trials and triumphs in the effort to save this critically endangered animal. Stay tuned right here on the Right Whale Research Blog for another season with the Aquarium's researchers in the field!